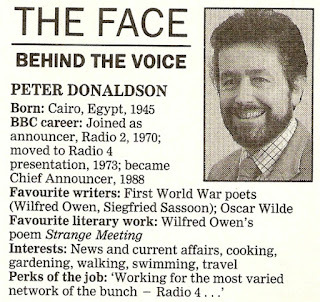 Whilst Peter is mainly associated with Radio 4 I thought it would be interesting to look in a little more detail at his early radio career in the late 1960s/early 1970s. 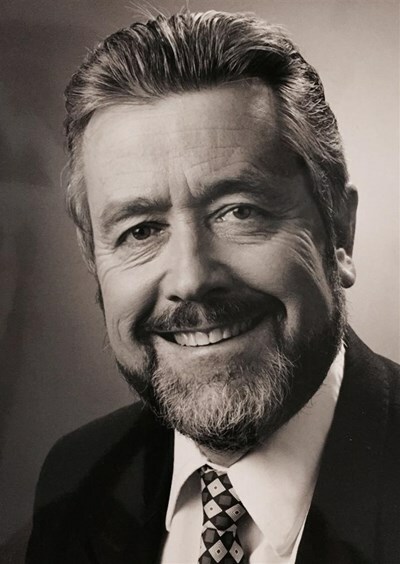 He first started broadcasting for the British Forces Broadcasting Service in 1967 - a year earlier than I posted in the above video and as quoted in a number of obituaries. Working for BFBS Aden he was there during the Aden Emergency and was on-air when the station was forced to close in November. His next posting was with BFBS Dhekelia in Cyprus, the island on which he'd grown up before leaving in 1960 to continue his education in the UK. Subsequently he worked for BFBS Tobruk in Libya and, in 1969, BFBS Malta. 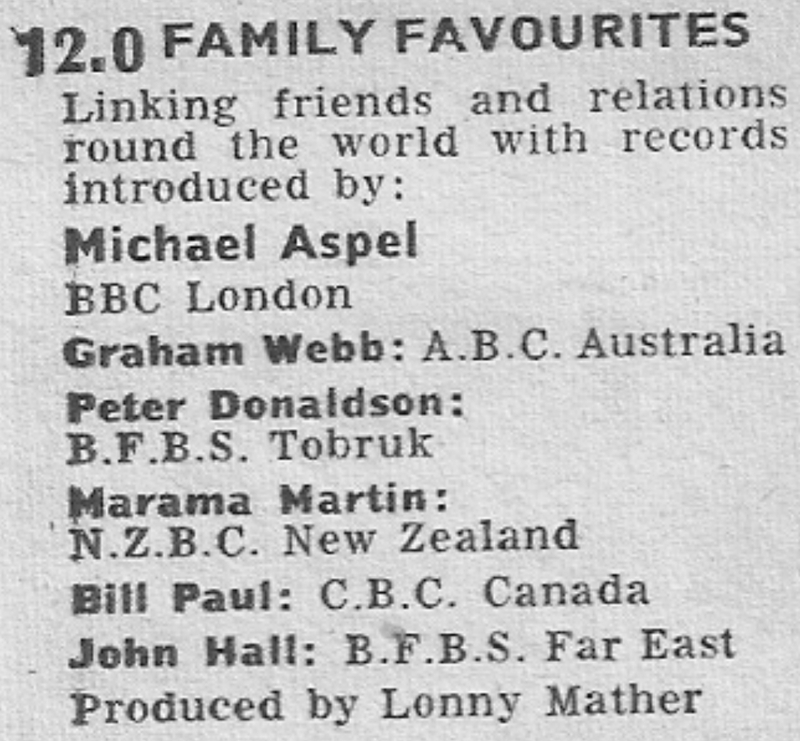 His first appearance on the BBC's airwaves was actually on an edition of Family Favourites on 29 September 1968 whilst he was at BFBS Tobruk. He made further broadcasts on the show in 1968 and 1969. Peter joined the BBC on 6 April 1970 as an announcer and presenter on Radio 2. 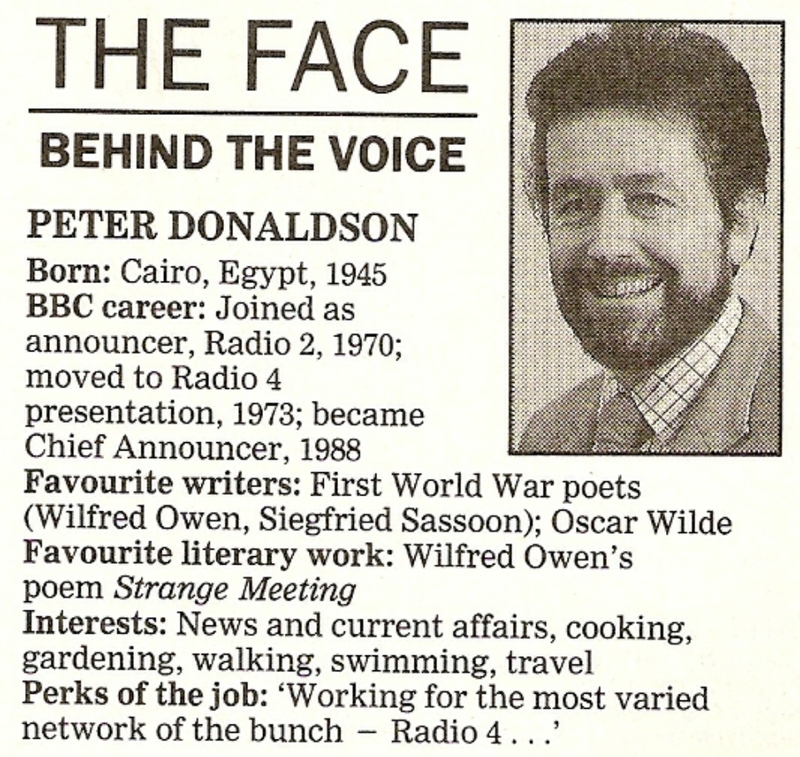 His first Radio Times billing was on 7 May when he hosted an afternoon of Davis Cup coverage, playing the music between Maurice Edelston's commentary. He joined the team of Night Ride presenters in June 1970, taking care of the Monday night editions until the following January. In the summer of 1970 he covered for Bruce Wyndham on Saturday's Breakfast Special. By December 1970 he was doing the occasional continuity shift over on Radio 4, and continued to do so throughout 1971. Meanwhile on Radio 2 in 1971 he popped up on Saturday Night with Peter Donaldson and Strings by Starlight and was back on Night Ride, this time the Tuesday night slot, from August through to the following May. In addition he presented a short mid-morning series called All Kinds of Music on Radio 4. When Radio 2's Breakfast Special ended in March 1972 it was replaced by both The Early Show and Terry Wogan. Announcers took turns on The Early Show with Peter's initial stint starting in May. 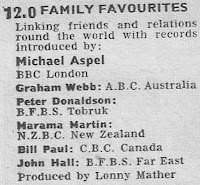 Again more Night Ride programmes followed from September 1972 to September 1973. From November 1973 Peter was now permanently on Radio 4, first as an announcer and than from 28 December reading his first news bulletin on the station. In 1974 reading and narrating on The Weekly World was added to his duties. But by June 1974 he'd disappeared from the airwaves. What Radio 4 listeners didn't know is that he'd agreed to head north to Sheffield and be part of Keith Skues's team at Radio Hallam, due to launch that October. Although he got round to recording a trail for his weekday afternoon show Roundabout he never made it on-air. 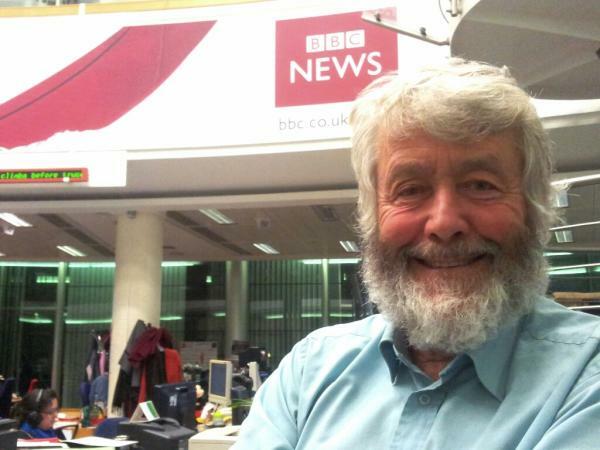 In fact he was back on continuity duty at Radio 4 by 20 September, about a fortnight before Hallam launched. The commercial sector, it seems, was not for him. Or perhaps it was the thought of being away from, or uprooting, his family. From November 1974 Peter was back on news-reading duties and then it was Radio 4 all the way: chief announcer from 1988 to 2003, retiring from the Corporation in 2005 and working freelance until his final bulletin just after midnight on 1 January 2013. Here's that final bulletin in full. You can donate to the Macmillan Cancer Support on JustGiving. This page has been set up by Peter's daughter as a thank you to the Macmillan Nurses who looked after him during his illness. With thanks to David Mitchell.